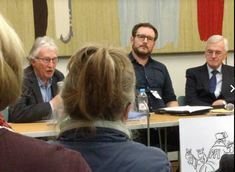 Hackney KONP's NHS privatisation exhibition shown in House of Commons, 13th March 2019, with speakers Eleanor Smith MP, Peter Roderick and Tony O'Sullivan. (Sadly, the event clashed with Brexit votes, and Shadow Chancellor John McDonnell MP wasn't able to speak). (more: see 'Artists' tab). Venue: Jubilee Room, House of Commons (wheelchair accessible). Please allow at least 30 mins for entry through security. The exhibition is about corporate involvement in the NHS and has been shown in over 20 venues throughout the country. It has been updated to include implications of the Long Term Plan and Integrated Care Provider contract. Click here to link to ELHCP's page on Estates. Scroll to the bottom of the page to download the Octoebr 2018 Estate Strategy. There are no plans for consultation on these proposed major changes - despite clear legal obligations for wide consultation. Hackney KONP demands full consultation engagement with the local community and involvement in any re-design of NHS services for Hackney people. Does the UK spend too much on healthcare? The government tells us it's becoming too expensive to fund our healthcare. But here is an OECD comparison (using latest figures from November 2017) of how UK spending on health (per head of population, in US$) compares with some other countries. ​KONP's initial response is given opposite. PFI: How Come We're still Paying for This? Government proposals for the NHS: Integrated Care Systems (ICSs) which are set to 'evolve into' Integrated Care Organisations (ICOs). Government proposals will replace the publicly provided NHS with Integrated Care Systems (ICSs) and Integrated Care Organisations (ICOs). 'Integrated' is simply the new (cosier-sounding) name for 'Accountable' Care Organisations (ACOs). These are US-style commercial, non-NHS bodies, which are set to run health and social services without proper public consultation and without Parliamentary scrutiny. ICOs can be given full responsibility for running NHS and social care services, and will be governed solely by company and contract law, not by parliament. No one doubts the need for improved co-ordination of health and social care. But we want to see it delivered through directly provided state services - not by for profit companies. Click here to hear what Dr Graham Winyard, former Deputy Chief Medical Officer and Medical Director, NHS England has to say about ACOs. (scroll down to below Chris Ham's presentation). In Spring of 2018, ACOs will be the subject of a legal challenge through judicial review - with Allyson Pollock, Sue Richards and Graham Winyard amongst the claimants. The Tories want to destroy our NHS. NHS England is driving the NHS towards a privatised and insurance-based system, leaving a defunded rump NHS for those who can't pay. Since 2015, the NHS has been completely reorganised, and this has occurred completely under the radar, with no new legislation (and, arguably, illegally), no parliamentary scrutiny and no consultation with staff or local communities. ​The 44 new Sustainability and Transformation Partnerships (STPs) across England are required to cut NHS spending by £22 billion by 2020 compared with 2015 spending levels. The NE London STP is called the East London Health and Care Partnership (ELHCP). It covers Hackney, Tower Hamlets, Newham, City of London, Waltham Forest, Barking, Havering and Redbridge. The population of this area is set to grow by 18% - numbers equivalent to the City of Leicester, yet health bosses are tasked with making cuts of £850 million from a local health service which is on it's knees. The Royal London Hospital, built through the Private Finance Initiative (PFI), has saddled NE London NHS with massive debts, while social care has suffered up to 25% cuts since 2010. The A&E at King George's Hospital Romford, and 200 acute beds are set to close. This will have a major impact on the local community and put further pressure on other NE London services. ELHCP proposals for Hackney could mean: Homerton Hospital downgraded from a District General Hospital (DGH) that currently offers a full range of treatment to an Elective (ie planned) Care Centre specialising in just one type of medicine - with Hackney residents having to travel to other parts of the ELHCP area for other routine treatments. A&E is likely to be downgraded. Under current proposals, Hackney's mental health beds would be moved out of Homerton and out of Hackney to Mile End, meaning patients lose vital community contacts. ELHCP proposals could also see important NHS property and sites sold off to plug revenue gaps and used for housing rather than the NHS and social care services we need. Hackney KONP is calling for full community engagement and consultation over these plans. Since 2017, NHS England requires STPs to move towards procuring huge 10-15yr £multi-billion commercial contracts for Integrated Care Providers (ICPs). These are single organisations combining all the health (and, often, social care) services across a Whilst we all want to see better integration of services, the Health & Social Care Act (2012) remains in place, requiring services to be put out to tender. The size and configuration of ACOs will be particularly attractive to giant healthcare corporates that run similar health organisations in the USA, so we risk wholesale takeover of the NHS by multinational corporates. Meanwhile, following publication of the Naylor Report, NHS England has launched Project Phoenix, a joint venture with major corporations that involves the greatest firesale ever of hundreds of valuable NHS sites, and up to £5bn of private capital investment for new NHS developments - the 2017 version of the scandal that is PFI. Many hospital trusts are transferring staff to wholly managed but private Subsidiary Companies ('SubCos') where wages, pension rights and other terms and conditions of employment can be cut. Other initiatives including the private GP At Hand are offering a cut-down app-based GP service for patients and creating huge problems from traditional GPs by cherry-picking younger, fitter, and therefore less costly patients leaving traditional GPs managing patient with higher needs. ​﻿This is the website for Hackney and City Keep Our NHS Public (Hackney KONP). Links to Hackney & Marion Macalpine's photographic exhibition about NHS Privatisation: How Come We Didn't Know? Plans to privatise the NHS have been developed over decades and successive governments have worked hand in glove with corporates to achieve this. Here is a link to information a brief history of privatisation in the NHS. 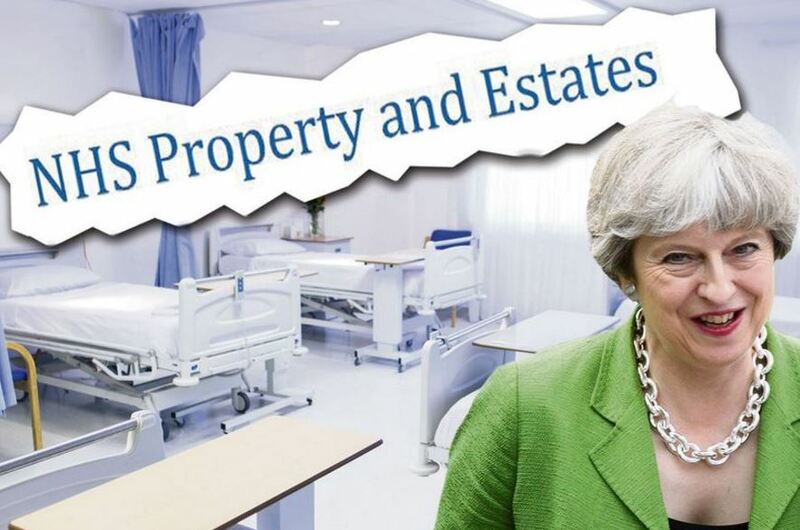 Naylor Report and Sell-off of NHS property and estates. The Naylor Report of 2017 sets out proposals to sell off NHS property that is 'underused'. Naylor uses the Carter Review to decide what counts as 'inefficient use' - based on a crude measure of space used for clinical activities. So other use - like play rooms for children or facilities for visitors are 'inefficient'!. When Virgin Care failed to win an £82m contract for children's services in Surrey, they sued the six Community Commissioning Groups (CCGs). Although the CCGs initially said they were satisfied that the procurement had been run fairly, the legal costs of fighting Virgin in court would have been immense. The settlement paid to Virgin is understood to be in excess of £2m - money desperately needed for NHS clinical services in Surrey. North East London Sustainability & Transformation Plan (STP) (aka Slash, Trash & Privatise plan). Barts & the London recovery plan (TST), covering all NHS services in Tower Hamlets, Newham and Waltham Forest. Read the excellent joint campaigns response to the TST Plan here. Hackney Devolution pilot (combined budgets and planning for all health and social care in Hackney & the City. click here for link to the June 2016 Plans. The NHS Bill (aka NHS Reinstatement Bill) has been presented to Parliament in previous years by Caroline Lucas (Green Party) MP and by Margaret Greenwood MP. 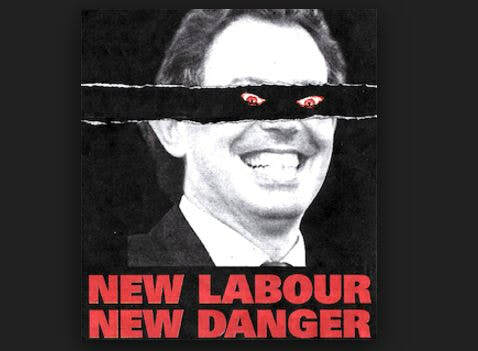 In 2018 it is due to be reintroduced by Eleanor Smith Labour MP for Wolverhampton. 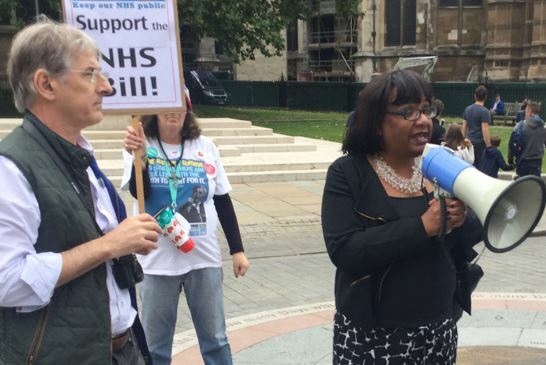 The Bill is supported by Diane Abbott, Hackney North MP and Shadow Secretary of State for Health. Click for more information. Contractors building a new pathology lab at the Homerton have gone bust, leaving the Homerton with massive debts. There are huge questions to be answered about the contract with the builders - but most urgently, managers are now considering proposals to privatise the pathology services. 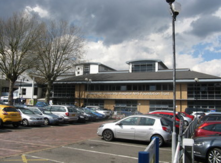 Homerton pathology provides an excellent responsive and high quality service. Privatisation is a huge concern. Don't let them destroy our excellent local service. Govt imposing £22 bn 'efficiency savings' (cuts) on NHS on top of £20 bn cuts of past 5 years. WHAT'S HAPPENING TO OUR NHS? The government is tearing the NHS apart through funding cuts and privatisation, putting private profits ahead of patients. We urgently need new legislation to restore our NHS. Government claims the NHS is 'unaffordable' and 'unsustainable'. Think-tanks funded by vested interests regularly make proposals for NHS payments - £10 for GP or A&E visits, £75 'hotel costs' for an overnight hospital stay and so on. Yet England spends far less on healthcare than France or Germany. And billions of NHS cash is wasted through costs of the NHS market, PFI schemes and private profit. Before the NHS market was introduced, just 5% of the budget went on administration. The introduction of the market meant splitting the NHS into separate 'purchaser' and 'provider' arms and huge additional legal and administrative costs of buying and selling services, tendering and managing contracts. By 2010 administration stood at 14% of the NHS budget. Since the Health & Social Care Act of 2012 has forced more services to be marketised. Abolishing the NHS market and returning to pre-market administration cost levels would save between £4.5bn- £10bn every year! 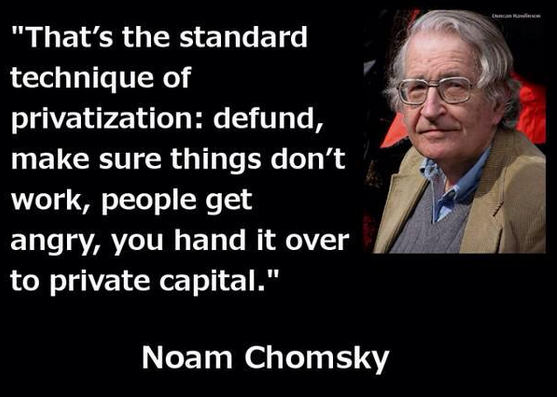 Billions of NHS funding is squandered on extortionate PFI contracts. The Department of Health has 118 PFI schemes with a capital value of £11.6bn. But repayments on these schemes will amount to a staggering £79.1bn. PFI repayments are already bankrupting some NHS trusts and the costs are rising steeply. More than £12bn worth of NHS contracts have been awarded to the private sector, siphoning NHS funds into private profits. The EU-US Transatlantic Trade and Investment Partnership (TTIP) and CETA trade treaties will force all NHS services to be tendered. Sustainability & Transformation Plans will force a huge new wave of privatisation from 2017. New STP plans will slash £millions from local budgets through cuts and closures and impose new models of care with fewer hospital beds, less doctors and professional staff, privatised services and risks to patient care and safety. These policies are wrecking the NHS. Government is on course to replace our healthcare system with US-style, hugely expensive, privatised and insurance-based healthcare. The NHS will remain, but only as a residual and greatly underfunded service of last resort, and caring for unprofitable cases. Our aim is to stop this! Until recently the NHS has provided outstanding and very cost-effective healthcare. We've paid less for our healthcare, enjoyed better health outcomes and better satisfaction rates than almost every other country. Click link above for details of the 2014 Commonwealth Fund study, with NHS data up to 2010. Click here to support the Pollock-Roderick NHS Bill that will reinstate the NHS and to email MPs and parliamentary candidates asking them to support this bill. We are the Hackney and City branch of the national campaign Keep Our NHS Public (KONP). We are campaigning for a publicly funded, publicly provided and publicly accountable National Health Service, both locally and nationally. 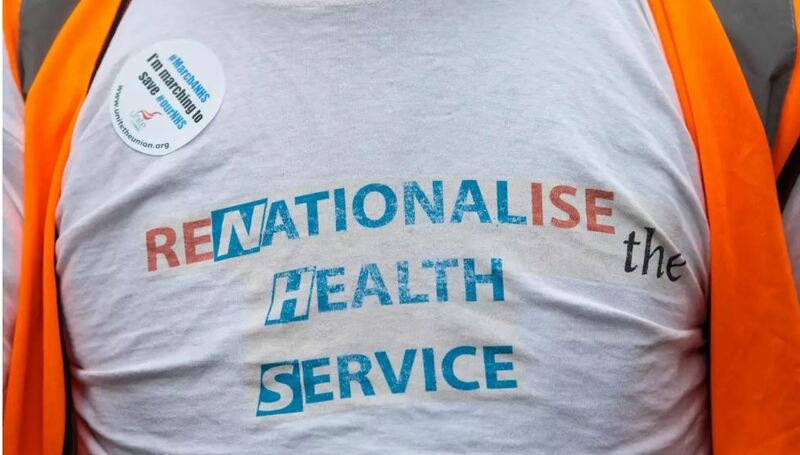 We campaign against UK government measures to undermine the NHS by promoting marketisation, privatisation, and fragmentation and against cuts and reductions in NHS services. We aim to highlight and oppose the impact of these UK government policies on our local NHS services. More info. End privatisation of the NHS and bring back government responsibility, ownership and accountability. End expensive and compulsory competition, reject the Transatlantic Trade & Investment Partnership (TTIP) and reverse all foundation trust plans. Commit to 4% real terms annual increase in funding from taxation to provide a comprehensive, publicly provided, top quality NHS for all, safe staffing levels and fair conditions for staff. Halt all new private finance initiatives (PFIs). Independent review of PFI deals with effective action to reduce unfair PFI debts. What can we do to save the NHS? Support the Campaign for the NHS Reinstatement Bill 2015 which would remove the healthcare market and restore an accountable, democratic NHS. Demand support from your MP and parliamentary candidates for the NHS Reinstatement Bill. write to local and national papers; complain to the BBC, ITV and Channel 4 about their failure to report the destruction of the NHS and protests against this.